With waterfront dining at a premium on the Gold Coast, it’s surprising that Quarterdeck Kitchen & Bar is still a secret haven, frequented by locals, boaties, football stars and millionaires. New owner Kieran Hogue and his wife have undertaken some smart renovations, including a stainless-steel bar and new tables, decking out the venue like a beach house, instantly approachable and welcoming. Through floor to ceiling glass there’s a stunning 180-degree view of yachts, water and the unspoiled natural habitat of Hope Island stretching out beyond the veranda. In a great rendition of the ever popular ‘Fish and chips with tartare’, Chef Kingsley shares his herb crust recipe with us. 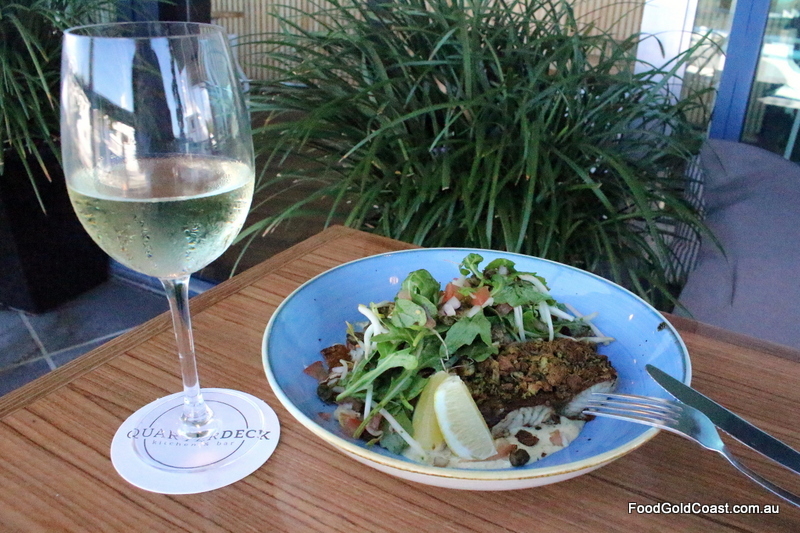 At Quarterdeck, barramundi from Humpty Doo in the Northern Territory is seared, topped with a pesto crumb crust and finished in the oven before serving with crispy kipfler potato, a rocket salad with salsa, fried capers and a house tartare. Read our review of Quarterdeck Kitchen & Bar here. NOTE: This article was published in The Sun newspaper on 3 April, 2019. Take a mixed selection of fresh herbs, the more the better. Use all the leaves and some of the soft stalks: basil, rosemary, thyme, mint, coriander, sage, parsley and dill. Lay herbs out on a flat surface, sprinkle with a good amount of salt and allow time to draw moisture from the herbs. Shake excess salt from herbs and add to a blender. Blend all herbs together until it becomes a rough paste. Add some bread that’s a few days old, (any bread will do, but we use sourdough), squeeze a whole lime into the mix and blend until the bread breaks down to a crumbed texture. Add more lime or bread if you need adjust the texture of the mix. Sprinkle over any fresh fish before finishing it in the oven to add a bright herb dimension to your seafood.